Sam Hurd, seen here making a play earlier this season, was arrested in Rosemont, Illinois, on drug charges this week. [Updated at 8:03 p.m. ET] Sam Hurd was released on a $100,000 cash bond late Friday afternoon. His case will now be handled by the federal court for the Northern District of Texas. Hurd waived his probable cause hearing so his case will move to a grand jury, which will decide whether to indict him, the U.S. Attorney's Office said. Sean Jensen, an NFL Columnist for the Chicago Sun-Times, told CNN that the Chicago Bears organization was blindsided by the arrest of one of the most "cordial, friendly and accountable" players in the clubhouse. "Everybody throughout this building is shocked by this revelation the other day. The team didn't know anything of it until Thursday morning when Sam Hurd wasn't in the usual receiver meeting. That's when they started asking around and figuring out what happened," Jensen said. [Posted at 3:49 p.m. 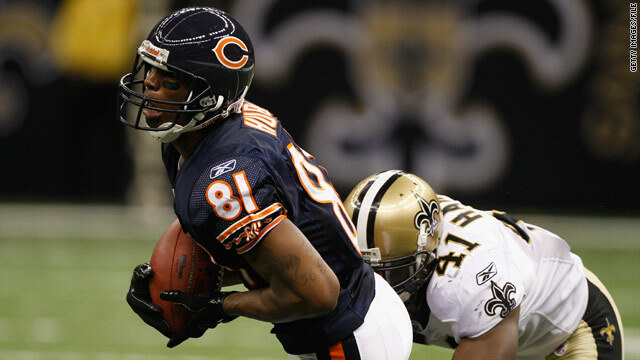 ET] A judge granted Sam Hurd a $100,000 bail in a federal drug case that alleges the ex-Chicago Bears receiver conspired to buy hundreds of thousands of dollars worth or mairjuana and cocaine for distribution in the Chicago area, according to the Chicago Sun-Times. Judge Young B. Kim set the bail amount Friday afternoon hearing in federal court, where Hurd appeared in an orange prison jumpsuit with his feet chained together, the paper reported. Hurd looked to the gallery, where his father and wife, Stacee, sat, as he entered the courtroom, the paper said. He spoke only to say “Yes, sir” to Kim’s questions. [Posted at 3:23 p.m. ET] Bears GM Jerry Angelo announces the team has cut player Sam Hurd. In defending their signing of Hurd, "We did everything we know to do in terms of our research, and there was nothing we heard that would present a real concern in the Sam Hurd case. ... We are very shocked about what we heard." [Posted at 2:42 p.m. ET] Chicago Bears wide receiver Sam Hurd is set to appear in court to request bail Friday afternoon, two days after a federal agent said he picked up a kilo of cocaine at a steakhouse, according to CNN affiliates. Hurd’s arrest stunned players and reporters who know him, and it seems they’re not so much in disbelief over the arrest of a professional athlete on drug charges as they are over how the criminal complaint makes this seemingly swell fellow out to be the “Freeway” Ricky Ross of the Chi-town. According to the complaint, Hurd, 26, whose base salary was $685,000 this year, met with a confidential informant and federal agent at Morton’s The Steakhouse in Rosemont, Illinois, on Wednesday. There, the complaint says, he told the pair that he and another person were running 4 kilograms of cocaine into the Chicago area each week, but his supplier couldn’t keep up. He then allegedly worked out a deal to receive 5 to 10 kilograms of coke (at $25,000 apiece) and half a ton of marijuana (at $450 a pound) per week. For the math-challenged, that’s a minimum of $575,000 worth of drugs. Every week. The married father of one and ex-Dallas Cowboy then got into his car with the drugs and was promptly arrested, the complaint alleges. ABC News reached out to the U.S. Attorney’s Office in Dallas, which would neither confirm nor deny the radio report. A representative said only that the criminal complaint leveled no such allegation. Linebacker Lance Briggs told Chicago's Herald-News that Hurd was a “nice guy” and was “well-liked in the locker room.” Fellow all-pro linebacker Brian Urlacher added that Hurd was a friendly fellow who always said "hi" in the hallway. “He’s a good teammate. That’s what I know of him. He comes to work every day and works hard. Outside of here, I don’t know him very well, but he comes to work every day and practices hard and plays hard. That’s all I know of him,” Urlacher told The Herald-News. Hurd's former Cowboys teammates were reticent with The Dallas Morning News, but privately they told a reporter that Hurd, who married his college sweetheart (they had a daughter last year), is one of the last people they would expect to be linked to this sort of activity. The Chicago Sun-Times’ Mark Potash said Hurd had recently gone above and beyond in an interview, explaining to Potash some of his teammates’ frustration with the offense. The interview extended past the mandatory player availability time, but Hurd didn’t seem to mind. Sometimes Potash would tell Hurd that there was no way he could be as happy as he always looked, “and he would smile and say something about getting only one shot at life and making the most of it,” the reporter wrote. Jean-Jacques Taylor of ESPN had a similar impression of Hurd, a man Taylor said had Scripture tattooed on his ribcage and often visited Taylor’s South Dallas church. Late last season, Taylor heard him singing a gospel song in the Cowboys locker room. His crooning was off-key, “as usual,” and Taylor teased him. Hurd responded, “God don’t care about your voice as long as you’re praising him,” Taylor wrote. Taylor said Hurd was “one of the nicest guys you’ll ever meet,” a guy he never heard curse, who had an incredible work ethic, who enjoyed video games and constantly picked teammate Terrell Owens’ brain for tips on how to get better. Indeed, the criminal complaint makes Hurd sound more like a wannabe drug kingpin than a God-loving workhorse and all-around good guy. According to the account from Homeland Security Special Agent George Ramirez, the case began in late July, during Hurd’s last days as a Dallas Cowboy. A confidential informant told an agent in Dallas that an alleged associate of Hurd's, identified only as T.L., was trying to procure several kilograms of cocaine. The informant coordinated a meet in Dallas, and when T.L. neared the location, the Dallas County constable pulled him over for a routine traffic stop. T.L. consented to a search of the car, the complaint says, and the officer found a white bag covered in marijuana containing $88,000. T.L., according to the complaint, said the money was Hurd’s. He further explained that he had known Hurd for a long time and that he worked on his cars out of a repair shop in nearby Coppell. It wasn’t uncommon, he said, for Hurd to leave “large amounts of currency in his vehicles,” the complaint alleges. Hurd later used T.L.’s phone to call Homeland Security agents and said the 88 grand was his, according to the agent’s statement. On July 28, Hurd met Homeland Security agents and allegedly told them he had withdrawn and wired the money from a personal account three days prior, before putting the bag of money into the car and giving the keys to T.L. for maintenance work and detailing. “Hurd subsequently provided (Homeland Security) agents with a bank statement that reflected withdrawals. However, a review of this statement revealed they did not reflect the transactions and amounts claimed by Hurd,” the complaint states. In mid-August, the complaint continues, T.L. set up a deal with the informant for 5 kilograms of cocaine and arranged to meet after hours at a Firestone shop where he worked. The following day, police in Denton, Texas, informed Homeland Security that Hurd and T.L. had exchanged text messages with four people in California who had been arrested with drugs, money and guns. “The text message content appeared to be consistent with narcotics trafficking and possible money laundering,” the complaint says. On September 9, T.L. and the informant discussed a deal for 5 kilograms of cocaine, and T.L. allegedly said Hurd’s cousins would complete the transaction, according to the complaint. It’s unclear from the affidavit what came of the deal. T.L. and the informant spoke again via telephone December 5, and T.L. said Hurd wanted to meet with the informant to discuss future business. The next day, the informant and T.L. met at a repair shop in Coppell, where T.L. called Hurd and gave the phone to the informant. Hurd allegedly told the informant he would send his associates to Dallas. According to the complaint, Hurd first said he wanted 3 kilograms before changing it to 5. After the call, T.L. explained how the deal would be conducted and said Hurd’s previous connection had supplied the wide receiver with $100,000 to $200,000 worth of narcotics a week, the complaint says. The informant called Hurd two days later to say the cocaine wasn’t available, and Hurd said he wanted to discuss other business with the informant, according to the complaint. Hurd allegedly met with the informant and undercover agent at the steakhouse the following week, where, ABC News reports, they ate $300 worth of filet mignon. Hurd told the informant and agent that his co-conspirator did the majority of the deals and that he “focuses on the ‘higher-end’ deals” before asking about Mexican mobile phones, which he believed police could not tap, according to the complaint. The cocaine exchange and arrest followed. Hurd appeared in court Thursday, where U.S. Magistrate Judge Young Kim ordered that he remain in custody while his attorney works out with prosecutors the details of his release on bond, the Chicago Tribune reported. If he is guilty of the single charge of possession of more than 500 grams of cocaine with intent to distribute, he could go to prison for 40 years and pay a $2 million fine, News Talk 790 AM in Lubbock, Texas, reports. But this isn’t his only legal woe. The Tribune reports that authorities plan to transfer Hurd to Dallas to face a count of conspiring to distribute more than half a kilogram of cocaine. The Bears are fighting for a wildcard spot in a tight NFC Playoff race, and though Hurd has only eight catches for 109 yards this season, he contributes in other ways. He has long been a special teams force, leading the Cowboys in special teams tackles in 2009 and 2010. Filed under: Crime • Drugs • Football • Illinois • Marijuana • Pro football • Sports • Texas • U.S.